A 2 day course with Ruth is an excellent way to improve your existing skills with the wheel, as well as learning new techniques. Rather than having a “syllabus” structure, Ruth will start the first day by discussing what you would like to focus on, as well as observing your work and making general suggestions on how to improve. From there she’ll be able to explore ways of improving upon your existing technique, if needed, and developing your work. Understanding the wheel, including gear ratios. How to produce a consistent yarn. Fleece sorting, preparation and merits of particular breeds. Perfecting long and short draw techniques. These days Ruth is in high demand as a teacher, classes often being booked up months in advance. Those familiar with the work of Mabel Ross will recognise many similar techniques and teachings styles, as Ruth held Mabel in very high regard, as both teacher and friend. Emphasis is placed on mastering the basics; once you have full control of both your wheel and yarn you’ll find that more advanced methods of spinning come much easier. Am I at the right level to do this course? 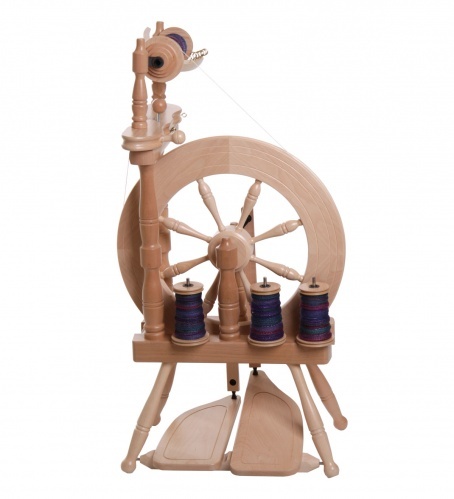 This course is ideally suited to those who are happy spinning a basic two-ply yarn. Ruth will help you progress your spinning, or perhaps stop any bad habits that may have crept in. If you are completely new to spinning you are welcome to join a group course, but you’ll probably get a much better introduction through Personal Tuition with Ruth. If you have a wheel then we suggest you bring it along. All wheels have their own character, so using your own will ensure you are comfortable with what you’re learning. You are of course welcome to try other wheels that we stock, depending on what is set-up at the time. Please bring a packed lunch. We also have a village shop which does excellent sandwiches just 5 minutes walk up the road. I’d specifically like to learn xxxx. Is this possible? If you have a specific technique that you would like to learn please let us know in advance. Can I use Wingham fibres? Is there any extra charge? You are welcome to sample spin any of the fibres we stock for no extra charge. We have a maximum number of 5 students. The 2 day course costs £100 per person. This includes: 2 days tuition with Ruth, sample fibres, use of Wingham equipment (if needed), tea and coffee. Lunch is not included, however there is a very good sandwich shop 5 minutes walk away, together with 2 pubs in the village.